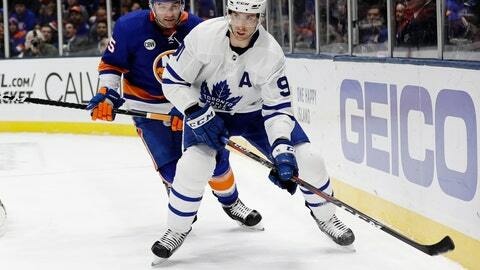 Tavares, held without a point while the Maple Leafs lost by a combined 10-1 margin in his first two games against the Islanders since leaving last summer to sign with his hometown team, broke through off a pass from Mitch Marner to make it 2-0 at 3:50 of the third period. Tavares added to his career best with his 46th goal and set a career high with his 87th point. New York squandered a chance to pull within a point of first-place Washington in the Metropolitan Division. Instead, the Islanders remained three points behind the Capitals and two ahead of third-place Pittsburgh. The Capitals and Islanders each have two games remaining — including the season finale at Washington on Saturday night. The Penguins have three games left. SUNRISE, Fla. (AP) — Vincent Trocheck scored two goals, including his 100th in the NHL, and Florida withstood a late surge to beat Washington. Troy Brouwer, Jonathan Huberdeau and Frank Vatrano also scored for the Panthers, and Aleksander Barkov had three assists. Barkov has 94 points this season, tying Pavel Bure for the franchise record set in 1999-00. Roberto Luongo made 27 saves as the Panthers won their third straight game. Jakub Vrana, Nicklas Backstrom and Evgeny Kuznetsov scored for Washington, and Pheonix Copley stopped 29 shots in his first start since March 19. T.J. Oshie had two assists and Alex Ovechkin added one. The Capitals had their four-game winning streak snapped and missed a chance to clinch their fourth straight Metropolitan Division title. ST. LOUIS (AP) — Ryan O’Reilly scored the only goal in a shootout and St. Louis slowed Colorado’s playoff push. CHICAGO (AP) — Kevin Hayes scored at 3:38 of overtime and Winnipeg beat Chicago to snap a three-game slide and move into sole possession of first place in the Central Division. Hayes cut to the net off the right side, got past Dylan Strome and tucked a shot past goalie Corey Crawford. The playoff-bound Jets improved to 96 points, two ahead of St. Louis and Nashville atop the crowded division race. Jack Roslovic scored two goals to end a 22-game drought, and Adam Lowry also had a goal for the Jets. Connor Hellebuyck made 25 saves. Jonathan Toews had a goal and an assist for Chicago and set a career high for points with 78. The 30-year-old Chicago captain’s 34th goal tied his mark for one season, set in 2008-09. Crawford stopped 34 shots, including Mark Scheifele’s penalty shot 40 seconds into the second period, but Chicago lost for the third time in its last four. OTTAWA, Ontario (AP) — Yanni Gourde had two goals and an assist, and Tampa Bay became the third team in NHL history to win 60 games in a season with a victory over Ottawa. Mikhail Sergachev, Brayden Point and Steven Stamkos also scored for the Lightning (60-15-4). Nikita Kucherov had two assists and Andrei Vasilevskiy made 22 saves. The other teams to win at least 60 regular-season games were the 1976-77 Montreal Canadiens (60-8-12) and the 1995-96 Detroit Red Wings (62-13-7). LOS ANGELES (AP) — Derek Ryan scored twice and Mark Jankowski had a goal and two assists as playoff-bound Calgary defeated Los Angeles. The night before, Calgary clinched the Pacific Division title and the top seed in the Western Conference playoffs with a 5-3 win at San Jose. Jonathan Quick was removed in the third period after allowing seven goals on 25 shots. Dustin Brown scored for the Kings, and Anze Kopitar had an assist in his 1,000th game. LAS VEGAS (AP) — Jonathan Marchessault scored his sixth game-winning goal and Vegas topped Edmonton. Golden Knights goaltender Malcolm Subban stopped 18 shots while making his ninth straight start in place of Marc-Andre Fleury. Subban ended an 0-3-2 skid since earning his first career shutout on March 21 and has a 2.67 goals-against average during the nine-game span. Cody Eakin and Pierre-Edouard Bellemare also scored for Vegas. Connor McDavid tied a career best with his 41st goal and Mikko Koskinen made 28 saves for Edmonton. With third place in the Pacific Division and a first-round playoff date with San Jose already locked up, Vegas ended a five-game losing streak. The Oilers, meanwhile, started the game with their playoff hopes intact but were eliminated from contention midway through the first period when Colorado earned a point in a shootout loss at St. Louis. NEWARK, N.J. (AP) — Devils defenseman Connor Carrick scored with 4:10 left to break a tie and New Jersey defeated New York to avoid being swept in the season series by its longtime rival. Myles Wood and Travis Zajac also scored in the Devils’ regular-season home finale. Joey Anderson added an empty-net goal and MacKenzie Blackwood made 32 saves. The game was chippy with three fights, including a one-shot bout in which Brandan Lemieux bloodied Wood.